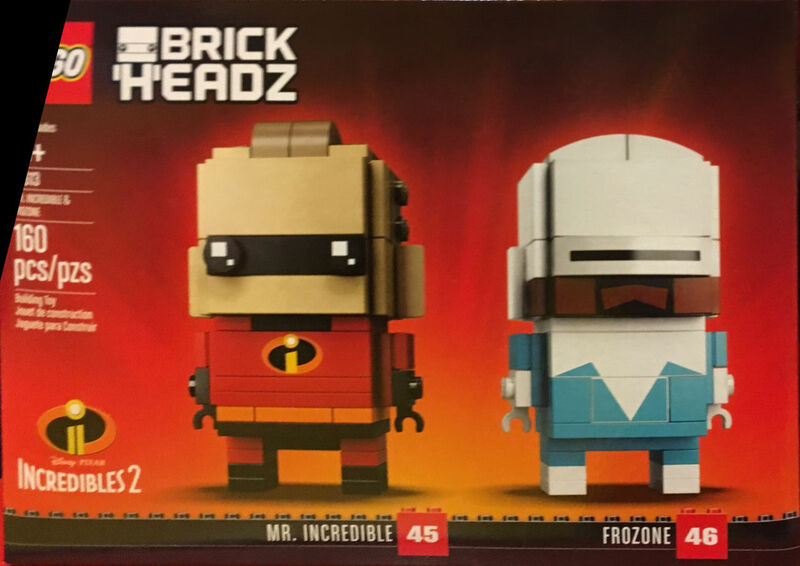 This Incredibles 2 BrickHeadz set has been found in a US LEGOLAND store today! 41613 Mr. Incredible & Frozone contains 160 pieces and its regular retail price is $20. An on-the-shelf image can be viewed after the break. Thanks to Nate J for the image. Frozone is the coolest Brickhead yet! Pun intended but he is also coolest without the pun. Definitely getting this, too bad we don't also have a Frozone minifig. Please don't let this be another Rey and Kylo Ren, with no release in the UK. WHOA!! Those are really great! Frozone is so cool, I love it. Frozone looks pretty good but it's all just printed bricks and some slopes on the head. I can see Mr. Incredible's chest piece going for a lot on Bricklink. Baby Yoda's right, it's mostly all just printed bricks. I wish they’d produce BrickHeadz in Light Flesh. Mr. Incredible looks weird with darkened hair since his skin is the same color his hair SHOULD be. "Honey!!! Where is my super suit???" My kids would love these.. Does anyone else remember when Brickset wasn't just about Brickheadz and Star Wars? Still not a huge fan of the range, but once again those two look very good. Frozone has really a great design. @the Rancor: The only thing that is different between the 41489 set and the individual sets is the packaging and maybe the instructions. The Actual Lego is the same. @Aleydita: As stated on another post the only reason that Brickset is doing a lot with the BH and SW is that those are the things that are coming out now. With May the 4th (and the SW promotion that will happen with it) coming there is a lot going on, not to mention a movie coming out soon. @aleydita - Out of curiosity, what else would you have us discuss at the moment? We have no control over what kinds of sets are being revealed or released at any given time of year. It just so happens that BrickHeadz, Star Wars, Incredibles 2 and TRON: Legacy have dominated the news over the last week and those themes are therefore subject to the greatest number of articles. Next week LEGO might announce something else entirely, in which case Brickset's focus would change to reflect that. Hundreds of sets released in 2018 across 30 different themes, with some of them receiving no love and others getting saturated levels of coverage, with almost all sets in that theme getting a review. Brickheadz is like Marmite, if you ram that theme down everyone's throats, you're turning a lot of people off, it's that simple. It's like someone said, each Brickheadz review is basically a hairstyle review. 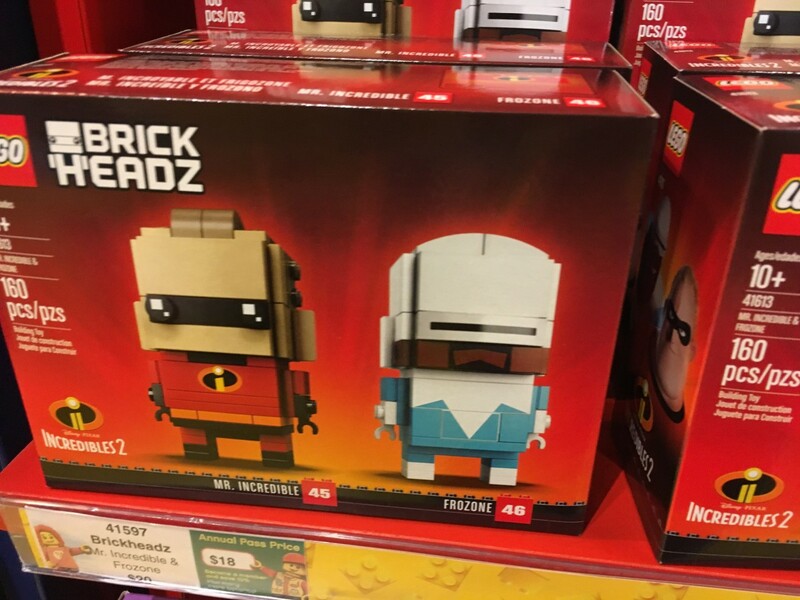 What bothers me the most about this isn't the fact the fact that these are Brickheadz, regardless of opinions. What really grinds my gears is the fact that Lego (and/or The Disney Empire,) has not seen fit to give us a Frozone minifig. It may seem like a trivial thing, until you take into account that every Brickheadz released thus far has also been a minifig. (or minidoll in a few cases.) Check the database if you don't believe me. The seasonal ones being the only exceptions. Unless this means a Frozone 'fig is, in fact, coming in a future set.